Due to there being no link between the wattage and brightness level of an LED bulb, as well as its complex circuitry it will most likely not work with your traditional dimming switch resulting in flickering, humming etc. See more information below or the Tips and Recommendations section to learn how to avoid this issue. There are several considerations to take into account when purchasing LED globes for a light fitting which is controlled by a dimmable wall switch or remote control, particularly one that was originally designed when there were only incandescent and halogen globes available for purchase. The new LED globes have rather complex circuitry, so often if the globe happens to work with one traditional dimmer it may not necessarily work with another version. First and foremost, keep in mind that there is absolutely no correlation between the wattage and the brightness level of the LED bulb. The wattage purely gives an indication of the energy the globe will use. When determining how bright a particular globe will be, ensure you check the Lumen rating. The higher the rating, the brighter the light. Although, the down side is that there are no actual regulations in place within Australia to state how it should be measured. As a result, one company may take the light cover (also known as a diffuser) off when testing the lumens, which means it will have a higher rating than one that leaves the cover on during testing. The way traditional dimmers work is they cut the amount of electricity being supplied to the globe in order to decrease the amount of light. However, because the LED’s wattage level has no connection to the brightness of the light it produces; this can prove to be an issue when using your existing dimming switch. If using a controller that is incompatible and not specifically built for dimmable LED globes, it will most likely be underloaded and this is when you may experience flickering or strobing effects on all dimmer levels or sometimes only at particular intervals. A consistent humming or buzzing sound is also likely to present itself as a consequence of the incompatibility. Alternatively, the light may not turn on at all or potentially you will only be able to use it on the highest level of brightness. Always be aware of non-dimmable LED’s. To be on the safe side look for the Dimmable label on the packaging of the globe. If this function is not clearly stated, it is safer to assume that the globe is a non-dimmable option. Remember to keep in mind that even if the dimmable or non-dimmable LED works to some extent with a traditional dimmer designed for incandescent globes it should not be taken as an indication that the LED globe will work with another model that is exactly the same or slightly different. Below are a few general tips and recommendations to avoid this issue. Try locating a bulb compatible with your traditional dimmer switch. Otherwise, replace the existing switch with one that is known to be compatible with your preferred LED globe. This will help you to avoid flickers, hums and buzzing sounds. When upgrading your globes to be LED, consider purchasing a compatible dimmer (if available) or replacing your existing fan with one that is specifically built to cater to the use of LED globes. Using a non-dimmable globe for dimmable purposes will severely shorten the globes lifespan. In almost all scenarios they will only work with a dimmer switch (even if LED specific) when set to full brightness. On other brightness levels flickering and humming will generally occur as most will not have this functionality enabled within their circuitry. If using a dimmable LED globe with an appropriate and suitable dimming switch however, the light still flickers, hums, only works on the brightest setting, doesn’t turn on or so on; there may be another underlying cause as these symptoms are not specific to using an unsuitable dimmer. These can include overloaded circuits, outside interference or voltage irregularities. Typically, Smart Bulbs will not work with any other dimmer switch other than the included app or remote control. This is due to the globes inbuilt dimmer conflicting with the external dimming mechanism. Consequently, this could cause flickering and other common incompatibility behaviours. Leading edge dimmers have been in the market a lot longer and were traditionally used to dim incandescent and halogen globes. This means they generally have a higher wattage range making it unlikely that they will work properly with LED bulbs. For example, if the LED globe happens to work with a traditional dimmer you may find it turns off at a certain point. This is often due to the voltage not being sufficient to power the LED globe as most dimmers have a minimum voltage requirement. Trailing Edge Dimmers on the other hand have been designed with the purpose of being used with LED globes. They have more complex circuitry and the wattage required for these dimmers is much lower, allowing LED globes to generally meet the required tolerances. 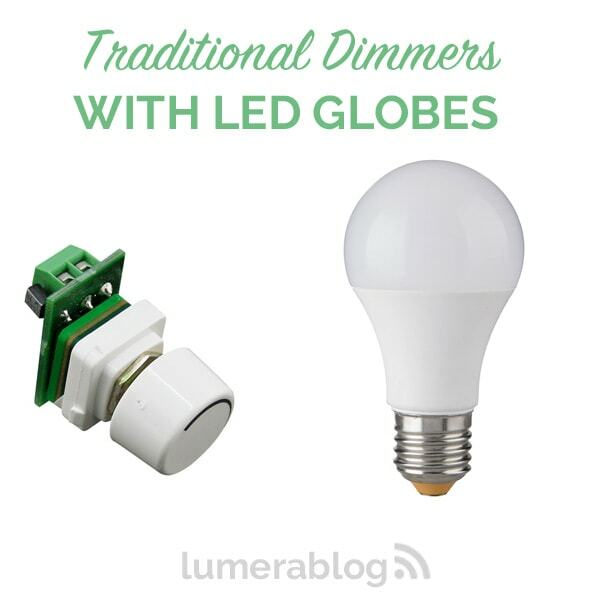 However, ensure you still check which globes are specific to certain types of dimmers. Just because the trailing edge dimmers are built to cater to LED globes it does not necessarily mean that all globes will work with a certain dimmer. Fun Fact: LED globes should not be used in enclosed spaces. An enclosed space is a confined area with extremely limited space and accessibility causing heat to become trapped. As you may know LED bulbs are able to remain cooler than their Incandescent/Halogen counterparts. The heat is drawn away by a heat sink in the base of the globe. Once pulled away the heat will then disperse into the air. Being situated in an enclosed space will result in the globe not having a means of dissipating the heat. On the contrary, the heat will not have anywhere to go so it will find its way directly back into the bulb. This occurring will drastically reduce the globes lifespan.